Education is not merely about knowledge attained through books and lecturers. It is a holistic process that involves so much more. At RATM, we understand this and offer our students an environment that is most conducive to learning. With state of the art facilities and amenities, we ensure that our students develop on the whole and leave our institutions as more sophisticated individuals. Well-structured and designed with all the latest facilities to provide the most conducive environment for learning. Augmented with the integrated teaching aids like computer terminals with internet, LCDs, Green Board etc. Spacious enough, well-lit, well ventilated, and accommodated with nice seating arrangements. Possessesing more than twenty thousand volumes of leading authors of India & abroad. More than sixty research journals of National and International repute are being subscribed to the book reservoir. The digitized library having network facility through DELNET is linked to 1000+ national and overseas library along with facility to access all the material present in electronic database across the world. Book Bank facility is being provided to the students. Having the latest operating systems such as Windows 2003 server, Red Hat Linux at the server level and Windows XP Professional OS at the client level. Linux based web & mail server solution. 2 mbps round the clock internet and intranet facility. Information wherever and whenever you want The Campus is wi-fi enabled so that the required information can be accessed at any place, with in the Campus. Three fully air-conditioned conference halls having seating capacity of 150 in each of them are equipped with all the modern audio-visual aids. The best internal structure of the halls along with great quality ambience proves to be ideal for the organization of different academic events. Vaastu-friendly hostels facilities for boys and girls separately having spacious accommodation with adequate furniture. The in-room facilities provided to the hostel occupants is suited for best holistic learning and comfortable stay. Safety, security, privacy of the boarders and discipline of the students are the major focus areas of hostel management. A highly furnished mess is being run in the hostels, where nourishing, hygienic and delicious food are prepared to make them feel at home, away from home. The refectory is the place where students of different courses interact with each other and enjoy delicious foodstuff. A well-designed and hygienic in-campus canteen supplies quality snacks and eatables to the students along with enough seats to emote and relax. Easy process for money matters Oriental Bank of Commerce facilitates the students, faculty and staff members to operate their personal accounts, transactions and to encourage savings amongst them. Its CBS branch is located in nearby, in the campus of Dental College just ½ km. from RATM Campus. Sports are of utmost necessity when it comes to students’ overall growth. The sports facilities at RATM are first-rate and include football, volleyball, badminton, athletics, chess, carom, table tennis etc. Medical aid is readily available round the clock by specialized doctors. RATM ensures that every students is taking care off at the premises, at any point of time there is a male/female attendant to help assist students for their medical need. 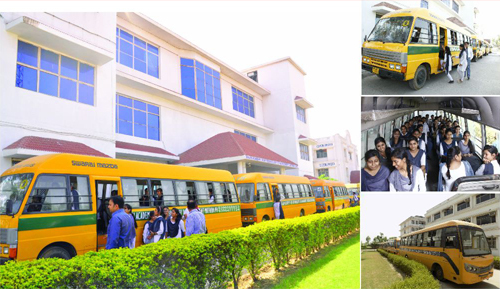 Commutation is fast here To ferry its students and staff from the city and surrounding areas conveniently like Mathura Refinery, Vrindavan, Kosi and from all other areas of city, the fleet of buses of the institute run at a highly subsidized charges. 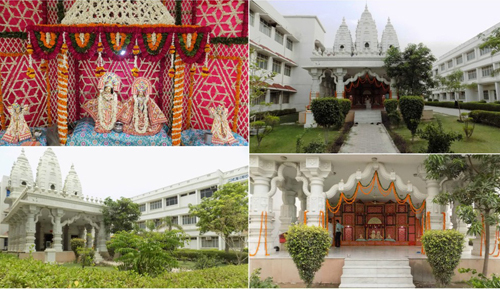 The beautiful devotional centre of architectural magnificence is being established for worshiping in the campus itself. The divine blessings always help all of us to excel in this world.